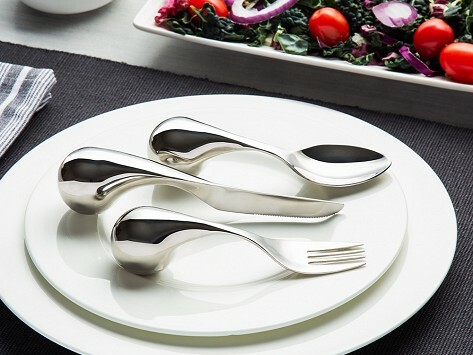 This polished-looking adaptive silverware set brings a sense of dignity to those with dexterity issues who need the extra help, but don’t want to stand out. The ergonomic designs feel good in the hand and are easy to maneuver, and because the set is made with stainless steel, it looks more like typical cutlery. A rounded handle is easy to pick up and a flat bottom prevents the knife, fork, or spoon from rolling out of reach. I had other adaptive cutlery but they were restaurant-grade, as in nothing fancy. It took a few uses to adjust to the ball, but I love how it love how it balances, and I'm busy writing out Grommet and Amefa at restaurants. Many seniors, especially with movement disorders, will be grateful. A soft make-up bag lets these ride safely in my purse. Very well made and attractive, but the length was too short for me and my wife to use effectively. All three utensils are very short. Because of that holding, these and picking them up is awkward.